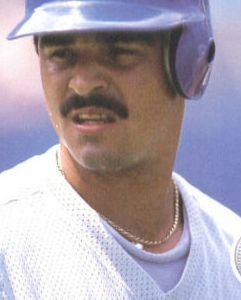 Mario Rafael Diaz Torres was born January 10, 1962 in Puerto Rico. He was signed by the expansion Seattle Mariners in 1978 and a decade later made his MLB debut. He played sparingly in Seattle for three seasons hitting over .300 twice with a high of 72 at bats in 1988. 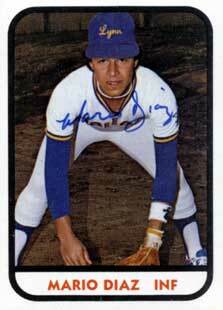 He got traded to the New York Mets in June of 1990 for Brian Givens when Kevin Elster went down with an injury. He would only play 16 games for the Mets (3-22) with a Mets career batting average of .136 with one RBI. His claim to fame in Mets history came in a crazy July 25th 1990 game against the Phillies. The Mets had a 9-0 lead going into the bottom of the 7th inning at Veterans Stadium. In the last of the 9th they led 10-3 & things looked pretty good. But Wally Whitehurst & Julio Machado in relief of Sid Fernandez, allowed seven straight hits & six runs before John Franco could put out the fire. The last out was a line drive to Mario Diaz playing at shortstop. Announcer Bob Murphy showed a rare moment of frustration as he made the call “"Line drive! It's caught! It's over! They win! The Mets win the ballgame! They win the DAMN thing by a score of 10 to 9!" Diaz was let go to free agency at the end of the season, then signed with the Texas Rangers. He played there for three seasons with a career high games played (96) batting .264. In 1993 he hit .271 with 2 HRs & 24 RBIs. He then signed with the Florida Marlins for two years before ending a nine year career in 1995. In 374 games played Diaz was a lifetime .256 hitter with 198 hits 5 HRs & 84 RBIs.